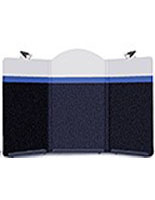 This countertop demonstration board features three panels with gray and black hook and loop fasteners for accessorizing the presentation. 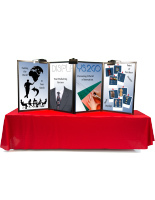 This folding tabletop display system measures 18"w x 32"h on the left and right sides, and 18" x 36" in the middle. 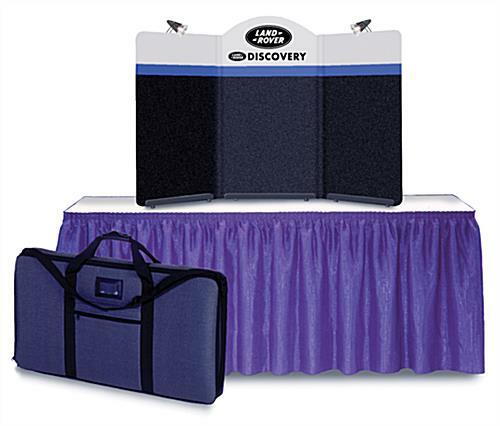 This demonstration board for tabletop ships with a nylon padded carry bag for convenient travel. Great for expos, and school science or art projects, this board for demonstrations includes a white header with a 1-color logo and text. Be sure to review the custom header graphics procedure below. Specify text and color in the "Special Notes" section of the order form when using text only. 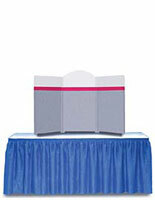 Please note: Headers are only available for the center presentation panel. 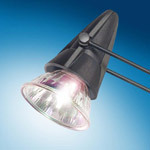 Add other trade show essentials to your order. 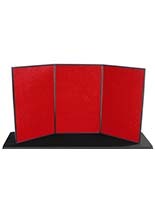 This include sign enclosures, brochure displays, plus hook-and-loop strips to customize this tabletop presentation board.